Jean died last Wednesday, March 2, 2011. We are all the better for Jean having been here. 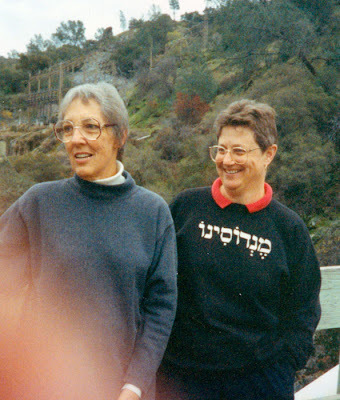 Jean and I have known each other for a long, long time. Way further back than the top photo here, taken about 15 years ago, on one of my visits to Jean and Frank's home. At the annual meeting of AQSG Oct. 2009, San Jose, CA. "Enjoy it, my Dears. Fifteen years from now, you will look back at this shot think you looked FABULOUS!" Thanks for the notice about Jean's passing and for your post. I cannot see a Sunbonnet Sue without thanking Jean for putting some fun in that gal. Thank you for this post. I cannot believe how time flies. 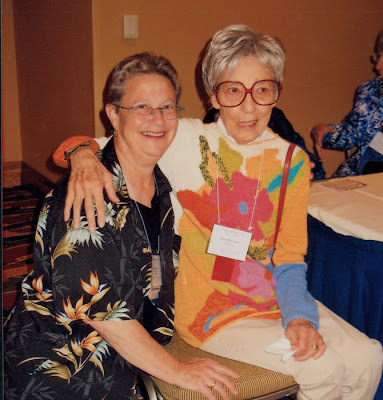 She was one of the most influential quilters when I first started quilting. Even though I did not know her personally, I certainly felt her encouragement. I'm very sad I never got to meet her in person. I know I would've loved her. 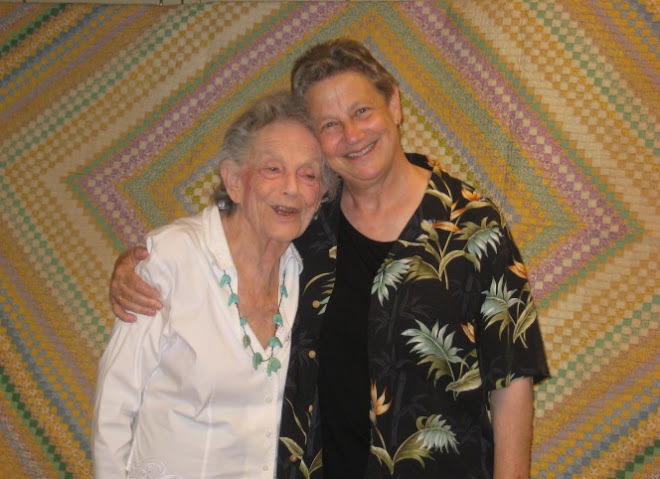 Jean was a bright star in the quilting world. I admired her for years before I had the opportunity to take a couple of her classes, where I learned to silk-screen using fabric paints. Her glow will live on in her quilts and the many books she wrote.